This has been another very cold week. Actual air temperatures aren't expected to get above zero today from a low of -17. It is supposed to be even colder overnight tonight. It is perfect weather to stay indoors and read which I have been doing. I did venture out for two doctor's appointments this week. I see my gastroenterologist every six months and have blood work done every three months. Things went well. There were no changes made to my medications or routines. I did get to Curves to exercise three times this week but the cold weather kept me home the rest of the week. My Curves location is so near that my car doesn't have a change to warm up before I get there. That is pretty hard on car batteries even if the car is almost new. Besides, I didn't want to bundle up to go out for just half an hour. I decided to finish the Peter Grant/Rivers of London series this week rather than reading them in the order I have them on my calendar. I really want to read the seventh book which I had for review and reviewed a while ago again now that I know what came before it. I'm probably going to stick to my plan and work on books that are actually on my calendar though. I spent some time this week setting up the placeholder posts for the books I plan to read in March and will probably finish setting up those posts this week. I also need to work on my State of the Stack post detailing my review book reading since that will be posted on Feb. 1. Say You're Sorry by Karen Rose (Feb. 12) -- Long romantic suspense title that begins a series. Well-developed characters and lots of action. My review will be posted on Feb. 9. How I Became a Spy by Deborah Hopkinson (Feb. 12) -- Nice middle grade historical mystery. Set in WWII, it introduces three characters from different backgrounds all in London just before D-Day. My review will be posted on Feb. 14. In the Dark by Cara Hunter (Feb. 19) -- There were lots of plot twists and turns in this tense police procedural set in Great Britain. My review will be posted on Feb. 13. Immoral Code by Lillian Clark (Feb. 19) -- YA heist story about five high school seniors who plan to steal college money from one of them's absent father. My review will be posted on Feb. 12. Broken Homes by Ben Aaronovitch (Feb. 4, 2014) -- 4th Peter Grant urban fantasy/police procedural. My review will be posted on Feb. 16. The Furthest Station by Ben Aaronovitch (June 30, 2017) -- Peter Grant novella. My review has been posted on Goodreads and LibraryThing. Foxglove Summer by Ben Aaronovitch (Jan. 6, 2015) -- 5th Peter Grant. My review will be posted on Feb. 19. The Hanging Tree by Ben Aaronovitch (Jan. 31, 2017) -- 6th Peter Grant. My review will be posted on March 19. My Favorite Cowboy by Donna Grant (Feb. 26) -- Rather melodramatic romantic suspense/Western story. My review will be posted on Feb. 20. Knife Children by Lois McMaster Bujold is a just published novella. LMB is one of my favorite authors. She is more or less retired but still publishes an occasional novella. This one is set in her Sharing Knife world which makes me want to read that quartet of books again. 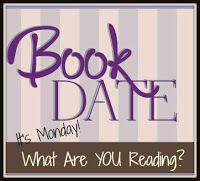 I am almost finished with my February review books and will begin reading my March releases. Lies Sleeping by Ben Aaronovitch -- my copy so that I have the complete series. I really want to read this again now that I've read all the earlier books in the series. That is a huge mailbox. The Cara Hunter book caught my eye. I like police procedures and I like settings in Great Britain. It's really cold here too. I used to belong to Curves and loved it but they closed the locations near me. Your books look wonderful. Enjoy and have a great week! Your books are calling to me. Thanks for sharing. I see that you go to Curves, which reminds me that I really enjoyed my time there. Maybe I should go again, even though they moved the gym farther along the freeway. Thanks for visiting my blog. I have a couple of the Ben Aaronovitch books, I better check which ones so I can start at the beginning. We've had to trickle charge my car twice already because I don't drive enough to keep the batter going in this cold weather. It's been really cold where I live too. Say You're Sorry by Karen Rose looks like an interesting read. It must be popular as I've noticed a few other bloggers reading it. Ooh very nice! All new to med reads! Hope you enjoy your picks for this week! Love that you loved Say You're Sorry by Karen Rose, any of her books I have read have hooked me right in. Hmm I might even buy this one - must look at the library first I guess. I have started Tai Chi and now found an online yoga for the over sixties that I bought and after one session I think its right on the button for me. The Rivers of London books look great. In the Dark and Say You're Sorry both sound like great thrillers. Stay warm! I’ve been counting shoveling snow as my exercise. It’s too icy to go far from the house. Have a great week! Glad your tests turned out well and no changes! Say Your're Sorry is going on my TBR list. I see quite a few other books I want to check out. Stay warm. Brrrr.... The only time I ever lived any place that cold was when I was a little kid. Since then I've been in CA or WA and can't say I miss the snow. Try to stay worm and snuggle in enjoying your books. Glad you still made it to Curves to exercise despite the cold. And believe me I know how you feel. It's been brutally cold here too. So many good books in your post. The Vanishing Stair caught my eye. I like YA historical mysteries. I'm always amazed at the number and variety of books that you read. Impressive. Stay warm and happy reading! I hope you are staying warm!! A ton of great books this week. I would add How I Became A Spy and your cowboy stories to my wish list. The True Queen seems neat too. Stay warm. I'm ready for late spring at this point and there is still plenty of winter left. Brrr! I don't blame you on staying home in that cold. That's great news about the doctor visits!